Ruth is 95 years young and lives in Benton Harbor. She has multiple disabilities and was unable to leave her home without being carried out. Not being able to leave her home created a feeling of isolation for Ruth as well as being a significant safety issue. 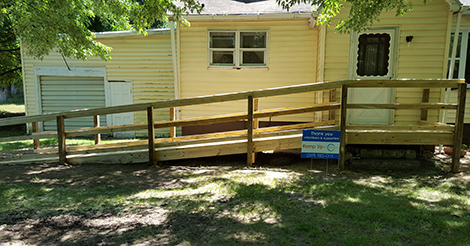 Disability Network Southwest Michigan coordinated volunteers from Harbor Habitat for Humanity and funding used from our Ramp Up program and St. Joseph-Benton Harbor Rotary Foundation to build a ramp for Ruth so she can independently access her community. Ruth is most excited that she can now visit her sister who lives in a nursing facility. Ruth also enjoys just getting outside and sitting in the sunshine.